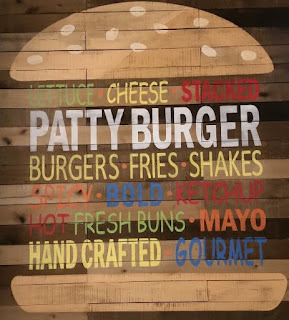 Last week I was fortunate enough to visit Patty Burger in Lake Orion, MI with a group of bloggers and foodies. Luckily someone pointed out that it's actually in a strip mall on the east side of Baldwin Rd, a little bit north of I-75 or Brown Rd. I'd noticed it before, since it's near where I live, but was kind of saving it for a date-night since the first thing I could see from the parking lot was the bar. They also promote lots of Happy Hour specials on their Facebook. 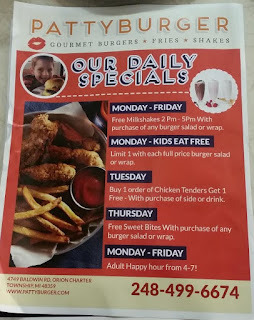 But we may be back sooner rather than later, as Monday is also Kids Eat Free night! Now that I've visited, I would totally be comfortable taking my kids here. On our visit, we started out taking some picture of some of the fabulous food and drinks. They've got a great menu of milkshakes available with or without a splash of alcohol to bring it up a notch. Completely worth noting, you can get a FREE milkshake with the purchase of a burger, salad or wrap on Friday, Saturdays and Sundays through November 26! As we moved to the meal part of our evening, we had to divvy up the drinks and things we'd been taking pictures of, and I got to have a delicious sangria beer. They have a nice selection of craft beers, but the sangria beer is really more fruit and sweetness than beer - totally to my liking! It was delicious. Once we were at our table, we all got a few minutes to peruse the menu, and then headed up to place our orders at the counter. I got the Saddle Up burger, with applewood smoked bacon, ranch dressing, and provolone cheese. I also ordered the fried pickles with the chipotle ranch dipping sauce. Don't get me wrong, the burger was good. But those pickles!!! Super yum! They were bread & butter pickle slices, deep fried in magic, and served hot and crispy. Several of us shared the pickles, the cheese curds, and the onion rings, and they were all great. I do have to say I'm admittedly a big lover of appetizers anyway, but they really stole the show here. I also had a few bites of the buffalo and the bbq salads, and while the shape was originally a little odd (no one I was chatting with had seen such a pile of salad before) they were both delicious. I'm looking forward to heading back to Patty Burger soon, and I'm glad Lake Orion has a new place that isn't on every corner. The original Patty Burger is in Chicago, so most of us around here haven't tried it yet. Along with the other sampling bloggers, I'm excited to offer you a chance to win a $50 gift card to Patty Burger! Use the widget below, and good luck! 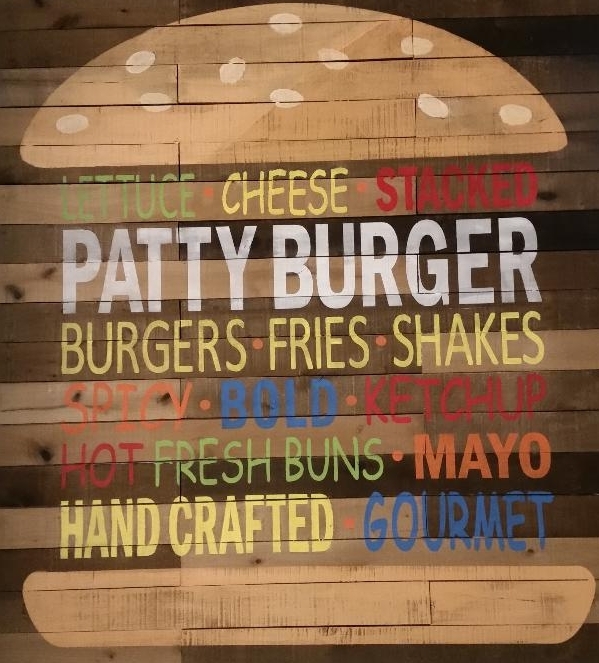 I received my tasting meal for free at Patty Burger in exchange for sharing my experience. All opinions are my own. Deep fried in MAGIC sounds about right, ha! I had never had FRIED bread & butter pickles before. I'll be back for those, the onion rings, and those delicious Sweet Bites. Scott is the burger lover. I am headed straight for the dessert you mentioned. That and a milkshake- I think that qualifies as dinner, right? Gonna have to try those pickles! Always like to try out a restaurant that is a bit different than all the other local options. I have never heard of this place. Looks and sounds delicious. I guess I’ll have to give it a try some time. Wow! This looks good. Great giveaway too!